I had been shooting with Canon since 1998-2014 my first Canon was the Rebel G 35mm film camera. When I graduated from 8th grade (Catholic School) my parents bought me a Ricoh KR-5 Super which I used from 1979-1998,so I'm not too much of a stranger to Pentax. After three months of researching and comparing, going to Photo Plus Expo than lifting and messing with buttons. I finally picked up a Pentax K-5IIs DSLR. I didn't think changing cameras would be such a big deal but it was, it pretty much boiled down to the Canon 7D,7DMarkII,Nikon D7100,Pentax K-3 and the Pentax K-5IIs.I wanted to stick with Canon because I didn't want to start purchasing new lens, but I also wasn't too thrilled with the choices I had and the budget I wanted to stay under. The clear choices would be the 7D (five years old) or the newer version 7D Mark II, even with it's minimum upgrade it is still a stellar camera. Until you pick it up, their cameras are getting heavier my 50D is already heavy enough. I scribbled Canon off the list, Nikon D7100 was next, light weight, ergonomically nice in my hands but 6FPS too slow, I shoot skateboarding and was currently shooting 6.3 I needed something a little faster or about the same speed. Nikon gets scribbled off the list, which leave me with Pentax. I liked the weight of the k-5IIs,DxO gave the sensor (Sony) a grade of 82 which is right up there with the Canon 1Dx and 5D Mark III. DPreview gave it a gold star which made picking this camera no brainer. 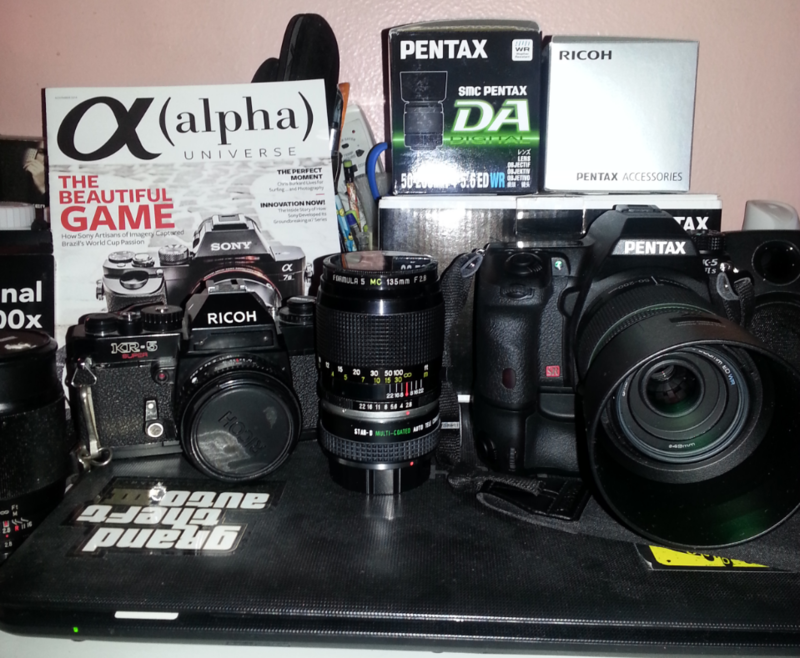 I'm glad to be back with Pentax/Ricoh! Congratulations. Have fun with k5iis! Welcome back! Your reasoning parallels that followed by many of us. I believe you will be very happy with your choice. Do you still have any of your old Pentax/Ricoh lenses? I scribbled Canon off the list, Nikon D7100 was next, light weight, ergonomically nice in my hands but 6FPS too slow, I shoot skateboarding and was currently shooting 6.3 I needed something a little faster or about the same speed. Hello Sportsgal501, welcome to the Forum! We're happy to have you back in K-mount land and best of luck with the K-5IIs! From my modest experience shooting skateboarding, I would suggest looking for some faster glass, even legacy primes around f/2.8, for sports photography. High fps rate and fast action dictate fast shutter speeds, higher ISO's and max aperture settings. The 'kit' zooms are usually f/5.6 at full zoom and f/4 - f/4.5 otherwise. An f/2.8 prime or zoom will result in a gain of two full stops of speed, whether faster shutter or lower ISO (or, one stop of each). The same advantage is also useful for night, low-light, street and action photography. Yes, f/2.8 zooms are expensive, from any maker. Big and bulky, too. But the resulting images will be better, imo. + 1 on what rbefly said. As soon as you can afford it get a good prime. You will be amazed at the difference. The same applies to the DA* zooms but they are very expensive. Glass matters. But just a note - a lot of people on these forums don't like DXO, because it is not always "fair" to Pentax. Of course this is debatable and we have both sides here. Anyway, I'm sure the K-5IIs will serve you well! The best part is that you can buy some older, even manual lenses and they will work just fine. Its a good way to get high IQ at affordable prices. Welcome to the forum. One thing that i like about the Pentax menus is how intuitive it is. Some people think it is sub par but for me it works fine. Canon also had a nice user interface. I did not care much for the Nikon UI. I switched form Canon too. My last camera was a 6D which was an amazing camera in low light. My first Pentax was a K5iis then the K3. If you want the faster frame rate, k3 is your camera. Pentax is lacking in a couple of key lens areas. The one I miss the most is the a pro-level fast focusing 70-200. I guess they are coming up with one soon. If you need the range and can find the latest Sigma 70-200. Get it. It is fast and has excellent glass. K3 tracking is not that great. Nikon is the king when it comes to motion tracking. My Canons sucked too in that department. Maybe I need to do more exploring to the get it right with K3. I tried the K3 at a wedding and the church tracking shots were 90% off which was a bummer. I was using the FA limited lenses. Perhaps that had something to do with it as the lenses are old style, screwdriver system. Let us know how it turned out with moving subjects and tracking. I would be curious to know if there is routine or technique that works so I can also use it for better tracking shots. Good move. Now you can go out and buy all those "oldie but goodie" lenses that still work on your new camera. Welcome to the club. Grab the 10-17 Fisheye zoom and have some fun at the skate park! "Until you pick it up, their cameras are getting heavier my 50D is already heavy enough. Cons: Heavy, poor battery life, Heavy"
This is one of the main reasons why I switched over from Canon to Pentax this year and I'm so glad I did. I have been shooting Canon cameras since 1999 myself switching over from Nikon. I started with an Elan II autofocus film camera and from there a Canon 30D, then a 5D, then a 40D, then a 7D. To me the 7D was a big disappointment. It was supposed to be packed with features, but to me other than a sensor with more mega pixels, it was a rehash of the 30D with a ton of useless customization features than one would never use. Plus it was heavy and the battery life was dubious. It was painful selling all that stuff after years of scrimping and saving, but I did keep the 5D and some choice lenses. Once I got the k-5II however, I barely ever picked up my Canon camera and lenses which are now collecting dust inside a closet. Who knows if I will sell or decide to keep my remaining Canon gear for sentimental reasons. First of all I found that the K-5 was technologically more advanced than any of my Canons. The shutter did not make this annoying loud Click, Clack and was way quieter and more responsive. I also found the menu system easier to get around with and more intuitive. Another thing I like about the Pentax was the "Art filters" particularly the double-exposure filter although I doubt if I'll ever use them too much, they are good to have. At least I can get a glimpse of what an image might look like after PP. It took Canon years to grudgingly install this feature on their cameras and that took a major software upgrade, also weather sealing. The one thing I'll miss about the Canons is the great customer service which is available 24/7. What I wont miss is the increasing prices for their lenses some of which have become out of reach for somebody with my budget. I mean I have other responsibilities and interests and Canon gear was just gobbling up all of that. I'm no longer shooting weddings, so I have the chance to build a lens system based on small excellent primes and maybe a zoom or 2 for convenience. Something I always wanted to do. Canon and Nikon offer so many cameras that I think it's hard for them to spread the features around, so you might find the same feature on one of their top professional cameras on one of their starter/beginner cameras, but not on one of their so-called Pro-summer(middle of the line) cameras , this used to drive me nuts. Nikon was always one stop ahead of Canon when it came to innovation. After the 5D every top selling camera Nikon offered blew Canon right out of the water. What Cannon did have is a wide choice of very good but very expensive lenses, but just as Canon, Nikon lenses grew in size and weight and price each year ! I often asked myself "shouldn't lenses be getting smaller now with all this advanced technology ? ". Last edited by hjoseph7; 11-30-2014 at 07:07 PM.